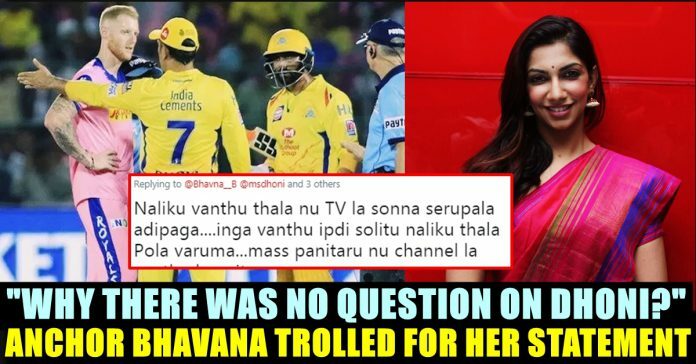 Anchor Bhavana Questioned Against Dhoni ?? Check Out The Replies She Received !! MS Dhoni became the first-ever player to win 100 Indian Premier League (IPL) as captain on Thursday when Chennai Super Kings piped Rajasthan Royals in a last-ball thriller in Jaipur. 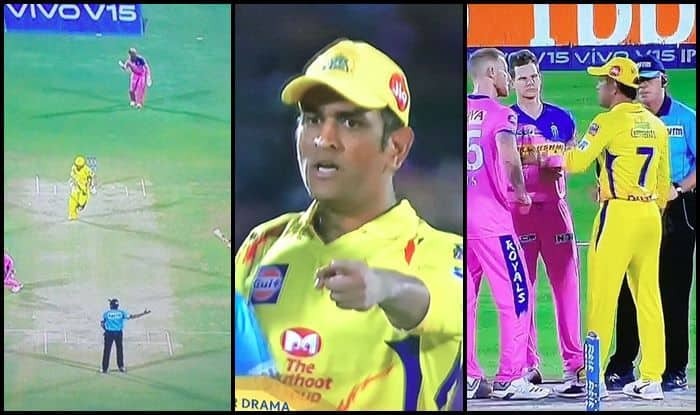 However, the major landmark was overshadowed by Dhoni’s uncharacteristic outburst at on-field umpires during the last over of a tense chase. Chennai Super Kings had needed 18 from the last over to secure a win in Jaipur. The visitors began the over well with Ravindra Jadeja hitting Ben Stokes for a six in the first ball but Rajasthan Royals pulled things back with the wicket of MS Dhoni in the third ball of the over. With 9 needed off the last three balls, New Zealand all-rounder Mitchell Santner walked out to bat for CSK. After Ben Stokes delivered the fourth ball of the over, on-field umpire Ulhas Gandhe signaled a no-ball for a waist-high full toss. However, Gandhe retracted his decision after leg-umpire Bruce Oxenford hinted it wasn’t a waist-high no-ball. Dhoni who witnessed it Dhoni stormed onto the pitch and confronted the umpire. Non-striker Ravindra Jadeja also joined the conversation but the revised decision stayed and Dhoni headed back to the dug-out disappointed. For this act the former Indian captain was charged 50% of his match salary as fine. Is there any rule that saying the captain shouldn’t come like this? 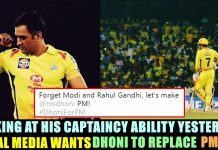 It may be wrong from rule book, but as a Captain, he has got every right to question the unethical umpire. Since he can’t call the Umpire on his mobile, he had to reach him by foot!!!!! Neeyae oru 2 yrs ah than cricket paesi pakuran….athukulla you’re questioning ms dhoni ?? Rules ah?? 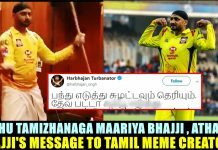 No ball kedaiyathu change panna theriyuthula? 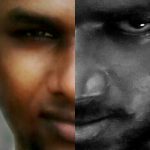 ?…MI match no ball therinchu therupu change panni last ball podalam la en podala…. 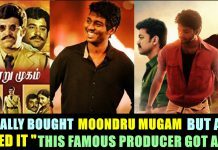 apo enga pona nee??? What do you think on Bhavana’s statement ?? comment your views below !! Previous articleShah Rukh Khan’s Emotional Message To His KKR Team After Two Consecutive Losses !! Next article“I Don’t Watch IPL But It Is Scripted” Said This Popular Movie Reviewer !! Got Trolled Like Never Before ! !